Lam had been asking, for weeks, to go Downtown to have lunch at the mall, walk around the other mall, and visit the Millennium Library. There was no school on Friday and the weather was too chilly to hit the playground, so I grabbed the kids and my camera and headed for our city's fair downtown district. 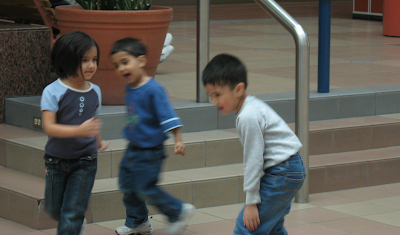 Besides, I learned very early on that, if I had errands at the mall, I should NEVER do it with the kids in tow. 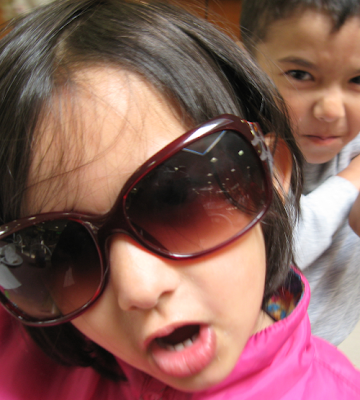 Take heed, soon-to-be parents, even the most well-behaved kids occasionally turn into monkeys on caffeine at the mall. My kids are angels (heck, their farts smell like flowers) and, for the most part, do what they’re told, but expecting them to follow me like little Children of the Corn on the rare mall trip is just nuts. So, no errands. I had tofu curry and honey garlic chicken at Little Bangkok Thai while the kids chose muffins for lunch. 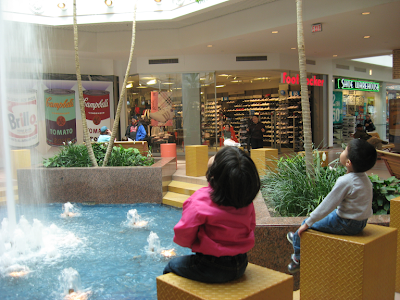 The kids loved the various skywalks and tunnels between the Downtown malls, throwing coins in the fountains, and running around the center court with a new friend. The afternoon came to a close with borrowing some Daniel Cook DVDs from the library and - the ultimate treat - picking up Daddy from work. Very adorable children!! I love how you described their farts. LMAO! You crack me up! Sounds like you all had a fabulous day. Hooray for fun Moms! Love how those pictures turned out and your children are beautiful. Very cool idea. I like the "millisecond where I thought of errands". ;-) I think we must do more like that. I stayed home one day during spring break because DH was sick. With the girls occupied on the computer (the *new* electronic babysitter! ), I figured he'd be ok if I took The Boy out for errands. It was awesome! (even if it WAS errands) He doesn't get much full-focus time. I just pushed him in the cart & chatted with him as we strolled leisurly around the store. Then he stuck a loonie in the car's CD player. Win some, lose some. :) Thanks! Glad I could give you a giggle. Thanks for the compliments :) the kids are cute, but i'm totally biased and, of course, I can't take all the credit... but I will anyway. lol! 24 hours really isn't enough to get things done in a day, isn't it? multi-tasking is inevitable, but I think I needed that day of "no errands" just as much for me as for the kids. I know this is evil of me, but if you haven't yet, check out my blogroll for more of my favourite blogs. ;) Bwahahahaha... !